Enhancing cellulase production in Trichoderma reesei is of great interest for an economical biorefinery. Artificial transcription factors are a potentially powerful molecular strategy for improving cellulase production in T. reesei. In this study, enhanced transcriptional activators XYR1VP, ACE2VP, and ACE1VP were constructed by linking the C terminus of XYR1, ACE2, or ACE1 with an activation domain of herpes simplex virus protein VP16. T. reesei transformants TXYR1VP, TACE2VP, and TACE1VP showed improved cellulase and/or xylanase production. TXYR1VP has a cellulase-free phenotype but with significantly elevated xylanase production. Xylanase I and xylanase II activities [U/(mg biomass)] increased by 51% and 80%, respectively, in TXYR1VP in comparison with parental strain RUT C30. The filter paper activity of TACE2VP in the Avicel-based medium increased by 52% compared to that of RUT C30. In the Avicel-based medium, TACE1VP manifested an 80% increase in FPase activity and a 50% increase in xylanase activity as compared to those of RUT C30. Additionally, when pretreated corn stover was hydrolyzed, crude enzymes produced from TACE1VP yielded a greater glucose release than did the enzymes produced by parental strain RUT C30. Production of environment-friendly biofuels and chemicals from lignocellulosic biomass, which forms the skeleton of all plant cells, has received extensive attention (Hahn-Hagerdal et al. 2006). The conversion of lignocellulosic biomass into monosaccharides using cellulase is a critical step in the biorefinery process (Parisutham et al. 2014). The enhancement of cellulase production greatly reduces the cost of a biorefinery of lignocellulosic biomass (Vicari et al. 2012; Biddy et al. 2016). Trichoderma reesei, an excellent secretor of enzymes, has been widely used for the industrial production of cellulase (Bischof et al. 2016). T. reesei produces three types of cellulases: cellobiohydrolases (CBH1 and CBH2), endoglucanases (mainly include EGL1 and EGL2), and β-glucosidase (mainly BGL1). Cellobiohydrolases and endoglucanases synergistically hydrolyze cellulose to produce cello-oligosaccharides (mainly cellobiose). β-Glucosidases degrade cellobiose into the end product glucose. T. reesei also expresses large amounts of xylanase, among which XYN1 and XYN2 are the most abundant (Zeilinger et al. 1996). Strain RUT C30 serves as a cellulase hyperproducer and is employed in research and in the industry (Martinez et al. 2008; Bischof et al. 2016). Therefore, enhancing cellulase production in T. reesei RUT C30 is useful for an economical biorefinery. Cellulase production in T. reesei RUT C30 is transcriptionally coregulated by a set of transcription factors (TFs), including XYR1, ACE3, ACE2, and ACE1 (Mach-Aigner et al. 2008; Häkkinen et al. 2014; Bischof et al. 2016). Among them, XYR1 and ACE3 are key transcriptional activators, and deletion of xyr1 or ace3 abrogates cellulase production (Stricker et al. 2006; Akel et al. 2009; Häkkinen et al. 2014; Castro Santos et al. 2016). ACE2 also serves as a transcriptional activator of cellulase production, and deletion of ace2 decreases mRNA levels of cellulase-encoding genes, such as cbh1, cbh2, egl1, and egl2 (Aro et al. 2001). ACE1 is recognized as a transcriptional repressor of cellulase production, and deletion of ace1 increased the production of all main cellulase and xylanase in sophorose- and cellulose-induced cultures (Saloheimo et al. 2000; Aro et al. 2003; Portnoy et al. 2011). Artificial TFs are a potentially powerful molecular strategy for modulating target gene expression and for obtaining an enhanced phenotype (Ju et al. 2008; Lee et al. 2013). Specific artificial transcriptional activators have been constructed to improve cellulase production in T. reesei (Su et al. 2009; Zhang et al. 2016a, 2017, 2018). An artificial transcriptional activator constructed by fusing the two DNA-binding domains of ACE1 and CRE1 with an effector domain of ACE2 can regulate the expression of cellulase genes (Su et al. 2009). T. reesei U3, a mutant strain with enhanced cellulase production, was identified via screening with construction of an artificial zinc finger protein library (Zhang et al. 2016a). Similarly, transformant zxy-2 of an artificial transcriptional activator—containing the binding domain of CRE1 linked to the effector and binding domains of XYR1—yields constitutive cellulase production from glucose as the sole carbon source (Zhang et al. 2017). A universal and simple pattern strategy for constructing a series of artificial transcriptional activators in T. reesei must be developed further. Recently, we improved cellulase production in T. reesei by substituting natural TFs with minimal transcriptional activators (Zhang et al. 2018) designed by linking one DNA-binding domain of ACE2 or CRE1 to the C-terminal 78 amino acid residues (aa) of herpes simplex virus protein VP16, which act as an activation domain that activates transcription of early viral genes (Sadowski et al. 1988; Triezenberg et al. 1988). Here, we developed three novel artificial transcriptional activators as enhanced transcriptional activators (ETAs)—XYR1VP, ACE2VP, and ACE1VP—in T. reesei RUT C30 via a universal and simple pattern strategy. These ETAs were constructed by fusing the strong transcriptional activation domain of VP16 to the C terminus of natural TFs (XYR1, ACE2, and ACE1) and transfected into hypercellulolytic strain T. reesei RUT C30 to replace the natural TFs (XYR1, ACE2, and ACE1, respectively) by homologous double exchange. Next, the effects of these ETAs on cellulase production were investigated. These ETAs were shown to improve cellulase production in T. reesei. Our study offers a novel strategy for obtaining high-yield cellulase T. reesei strains as well as provides insight into the regulatory mechanisms of action of TFs for cellulase production. Enhancing the function of TFs to improve cellulase production in T. reesei is considered an effective strategy (Zhang et al. 2018). We hypothesized that cellulase production would be increased by fusing the strong transcriptional activation domain of VP16 to the C terminus of a natural TF to enhance its transcriptional activation. 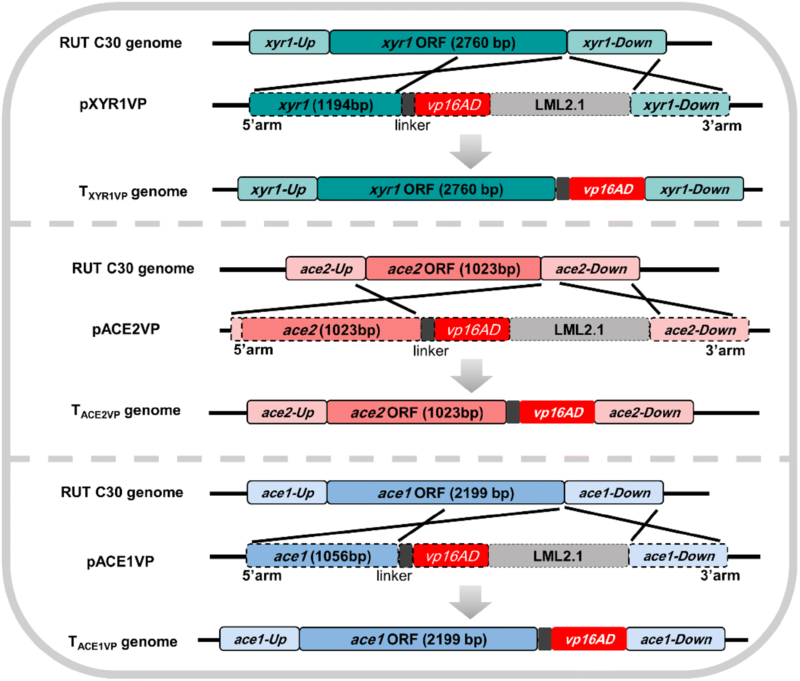 Three ETAs including XYR1VP, ACE2VP, and ACE1VP were designed by fusing the VP16 domain to the C terminus of XYR1, ACE2, and ACE1, respectively (Fig. 1). The expression plasmids pXYR1VP, pACE2VP, and pACE1VP for the three ETAs were constructed by ligating the erasable hygromycin selection marker LML2.1 (Fig. 1), which was eliminated by the product of a chimeric Cre recombinase gene (Zhang et al. 2016b). The expression plasmids were introduced into the genome of the T. reesei hypercellulolytic mutant RUT C30 by Agrobacterium-mediated transformation to replace natural TFs XYR1, ACE2, and ACE1 by homologous double exchange (Fig. 1), eliminating the risk of random insertion and unpredictable mutagenesis. The transformed strains with confirmed gene replacement were selected to eliminate the hygromycin selectable marker by xylose induction to obtain the final transformants. All the transformants were identified as correctly transformed ETA strains and harbored single-copy DNA integration (Additional file 1: Figure S1). Three randomly screened transformants TXYR1VP-1/-2/-3, TACE2VP-1/-2/-3, and TACE1VP-1/-2/-3 for each ETA were analyzed further. To determine whether the ETAs helped to increase cellulase production, we first examined the growth of the transformants using parental strain RUT C30 as a control. 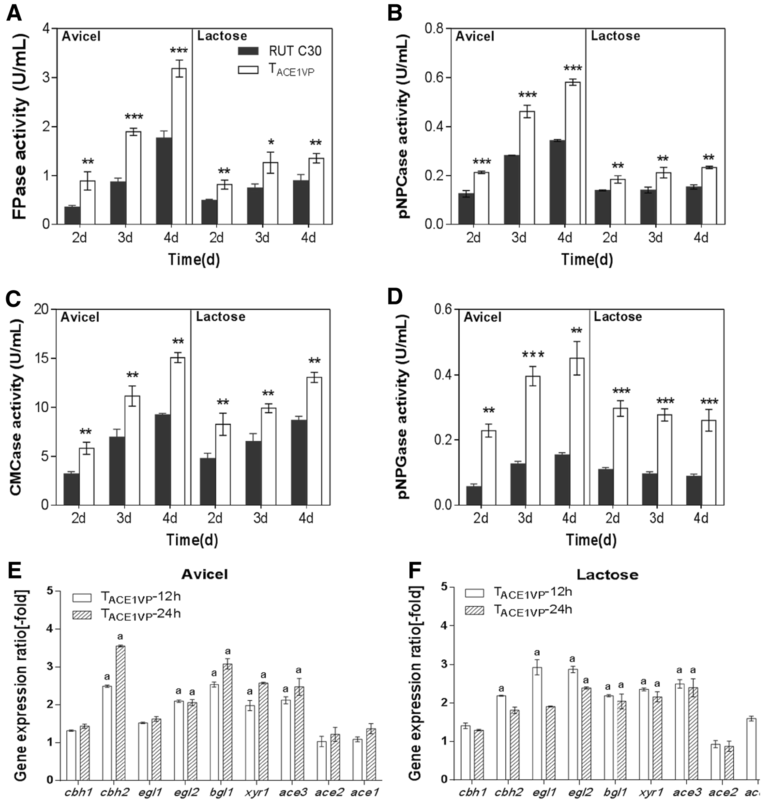 The growth of ETA transformants TXYR1VP, TACE2VP, and TACE1VP was investigated in the minimal medium (MM) containing glycerol, Avicel, or lactose as the sole carbon source (Fig. 2a–c). Regardless of the carbon sources, growth rates of transformants TACE2VP and TACE1VP were not significantly different from that of the control (Fig. 2a–c). Thus, ACE2VP and ACE1VP had no effect on basic cellular metabolism. Similarly, the growth of TXYR1VP showed no significant differences from the control when cultured in glycerol (Fig. 2a). Nevertheless, the growth rates of TXYR1VP on lactose and Avicel were much lower than the growth rate of the control, with growth on Avicel being particularly slow (Fig. 2b, c), indicating that XYR1VP limits cellulase synthesis in TXYR1VP. To test whether XYR1VP decreases cellulase production, we determined the cellulase-related activities of TXYR1VP under Avicel and lactose culture conditions. TXYR1VP manifested nearly no filter paper activity (FPA) in the Avicel- or lactose-based medium (Fig. 3A). Similarly, the p-nitrophenol-d-cellobioside hydrolase (pNPCase), the sodium salt of carboxymethyl cellulose hydrolase (CMCase), and the 4-nitrophenyl-beta-d-galactopyranoside hydrolase (pNPGase) activities in TXYR1VP were nearly absent as compared to the control (Fig. 3B–D). Additionally, the transcript levels of cellulase-related genes cbh1, cbh2, egl1, and egl2 were low compared to those in the control (Fig. 3E, F), suggesting that XYR1VP abrogated cellulase production. Consequently, the dramatically decreased growth rate of TXYR1VP on Avicel resulted from its cellulase-negative phenotype in the presence of inducing carbon sources (Avicel and lactose). A lack of cellulase hindered the growth of TXYR1VP in the Avicel-based medium. The cellulase-free phenotype was observed not only in XYR1VP transformants but also in ACE3VP transformants, in which the strong transcriptional activation domain of VP16 was fused to the C terminus of ACE3 (data not shown). Of note, although cellulase production of TXYR1VP in lactose- and Avicel-based media was abrogated, xylanase production of TXYR1VP was unrepressed and even enhanced (Additional file 1: Figure S2a, b). TXYR1VP showed a xylanase upregulation phenotype in glycerol- and lactose-based media, and a similar xylanase activity (U/mL) was observed in the Avicel-based medium as compared to that in the control. Additionally, TXYR1VP showed higher xylanase activities per unit of biomass with a 51% increase in xylanase I activity and an 80% increase in xylanase II activity compared to that in RUT C30 (Additional file 1: Figure S2a, b). Elevated transcript levels of xylanase genes were detected in TXYR1VP regardless of the carbon sources; this finding is consistent with the enhanced xylanase activities (Additional file 1: Figure S2c–e). TXYR1VP, a xylanase-hyperproducing strain with a cellulase-free phenotype, can be employed in some industries where xylanase is desired, while cellulase is undesirable, e.g., in paper recycling (Buchert et al. 1998). The transcript levels of TFs xyr1, ace3, ace2, and ace1 in TXYR1VP were also analyzed. As shown in Fig. 3E, F, ace3 and ace2 transcript levels were lower in TXYR1VP than in the control (the gene expression ratio was less than 0.5-fold). The transcript levels of the xyr1 domain were higher than those of the control (the expression ratio was more than threefold) and the transcript levels of ace1 had no significant differences from those of RUT C30, which cannot explain the cellulase-negative and xylanase overexpression phenotypes of TXYR1VP. XYR1VP abolished cellulase production and increased xylanase production in TXYR1VP. By contrast, overexpression of xyr1 has been found not only to markedly enhance xylanase activity but also to increase cellulase activity in transformants (Mach-Aigner et al. 2008; Uzbas et al. 2012). Therefore, we hypothesized that the C-terminal fusion of XYR1 would alter the function of XYR1VP. Using COILS (Lupas et al. 1991; Lichius et al. 2015) predicted that the C terminus of XYR1 is a coiled-coil domain and likely mediates homodimerization of XYR1. Therefore, fusing the VP16 activation domain at the C terminus of XYR1 abrogated the expression of cellulase genes in T. reesei. It is very important to study the function of the C terminus of XYR1. Nonetheless, the positive effect on xylanase gene expression observed after fusion of the VP16 activation domain indicated distinct regulatory mechanisms between cellulase and xylanase genes in terms of transcription. The different responsiveness of XYR1 to cellulase and xylanase was also observed by Pucher et al. (2011). Notably, the cellulolytic regulon of XYR1 is positively affected, whereas the xylanolytic regulon is affected negatively in a T. reesei QM9414 strain constitutively expressing xyr1 (Pucher et al. 2011). These different regulatory mechanisms for cellulase gene transcription are supported by in silico identification of XYR1-binding sites in promoter regions, which are reported to occur at dramatically different frequencies in the promoter region of cbh1 and xyn1: 14-fold for cbh1 and only 4-fold for xyn1 (Rauscher et al. 2006; Furukawa et al. 2009). The cellulase-related activities of ACE2VP transformant TACE2VP were detected to verify the effect of ACE2VP on cellulase production under Avicel and lactose culture conditions. TACE2VP had a significantly improved FPase activity (Fig. 4A), pNPCase activity (Fig. 4B), and CMCase activity (Fig. 4C) in both Avicel- and lactose-based media. The highest FPase activity of TACE2VP was 2.7 ± 0.2 U/mL in the Avicel-based medium on day 4; this effect was stronger by approximately 52% as compared to the control (Fig. 4A). In the lactose-based medium, FPase activity also increased by approximately 48% on day 4 as compared to the control (Fig. 4A). Additionally, the amount of protein secreted from TACE2VP increased (Additional file 1: Figure S3a). 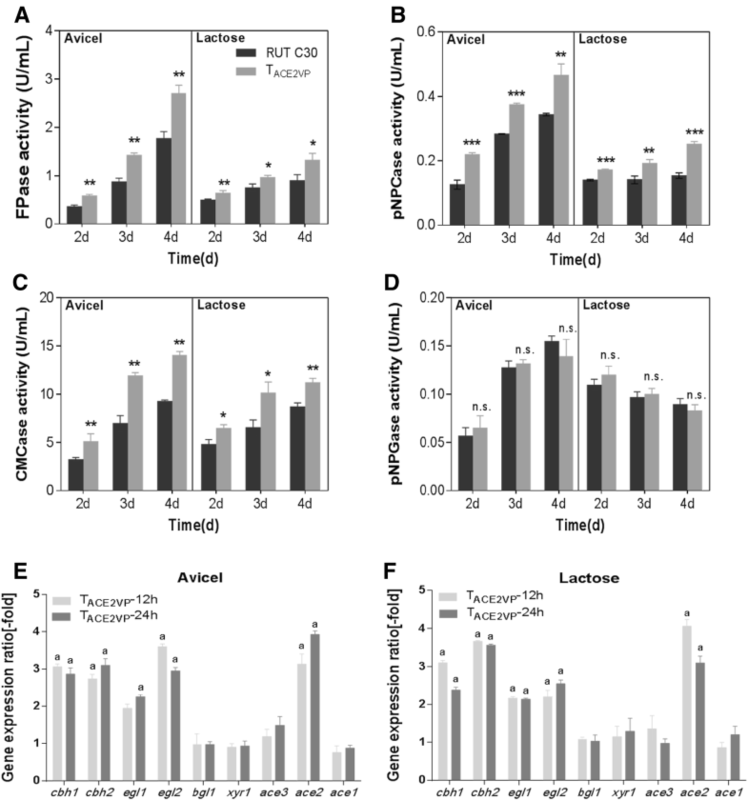 Consistent with the improved cellulase production, the transcript levels of cbh1, cbh2, egl1, and egl2 in TACE2VP significantly increased by 2.0- to 3.7-fold in lactose- and Avicel-based media for 12 and 24 h subculturing (Fig. 4D, E). It has been reported that deleting ace2 reduces total cellulase activity by 30–70% on cellulose (Aro et al. 2001). Because ACE2 was replaced by an ETA (ACE2VP), cellulase production was enhanced. Nonetheless, there were no significant differences in the pNPGase and xylanase activities between TACE2VP and control in either Avicel- or lactose-based media (Fig. 4D; Additional file 1: Figure S3b, c). Moreover, the transcript levels of bgl1, xyn1, and xyn2 in TACE2VP showed no significant differences in the lactose- or Avicel-based medium as compared to the control (Fig. 4D, E; Additional file 1: Figure S3d, e). One study revealed no effect on xyn1 expression in strains in which ace2 was deleted (Aro et al. 2001). It is possible that xylanase production was not improved in TACE2VP because ACE2 did not affect xyn1 expression, as was the case for ACE2VP. ACE2 can affect the expression of xyn2 and bgl1 (Aro et al. 2001; Stricker et al. 2008). Additionally, phosphorylation and dimerization are prerequisites for ACE2 to bind the promoters of target genes (Stricker et al. 2008). Fusion of the VP16 domain to the C terminus of ACE2 may influence the native effects on xyn2 and bgl1 expression. We also analyzed the relative transcript levels of TFs xyr1, ace3, ace2 (ace2vp for TACE2VP), and ace1 in TACE2VP. The transcript level of ace2vp in TACE2VP was approximately 4.0-fold higher than that of ace2 in the control (Fig. 4D, E), indicating that the VP16 domain fused at the C terminus of ACE2 elevated its own transcript level. The increased transcript levels of ace2vp in TACE2VP may have also promoted cellulase production. The transcript levels of xyr1, ace3, and ace1 in TACE2VP were similar to those in the control (an expression increase was approximately onefold), indicating that ACE2VP mainly affects the expression of cellulase genes and its own expression and has little effect on other TFs. To investigate the effect of ACE1VP on cellulase production, on the cellulase-related activities, and on the amount of protein secreted by ACE1VP transformants, TACE1VP and RUT C30 were examined under Avicel and lactose culture conditions. The amount of protein secreted from TACE1VP notably increased (Additional file 1: Figure S4a). Additionally, elevated cellulase activities were observed in TACE1VP as compared to those in the control in both Avicel- and lactose-based media (Fig. 5A–D). Cellulase production by TACE1VP was higher in the Avicel-based medium than in the lactose-based medium. The highest FPase activity of TACE1VP transformants was 3.2 ± 0.2 U/mL in the Avicel-based medium, with an increase in activity of approximately 80% on day 4 compared to that in the control; this result is consistent with the enhanced pNPCase, CMCase, and pNPGase activities (Fig. 5B–D). Xylanase activities (on day 4) of TACE1VP transformants rose by nearly 50% in the Avicel-based medium as compared to the control (Additional file 1: Figure S4b, c). These results suggested that ACE1VP promotes cellulase and xylanase production in both Avicel- and lactose-based media. It has been reported that ace1 is a repressor and deleting ace1 increases the amounts of cellulase produced in T. reesei (Aro et al. 2003). Here, ACE1VP is an artificial TF that promotes cellulase production. ACE1VP did not elevate the transcript level of itself but promoted the transcript levels of the cellulase genes and of transcriptional activators xyr1 and ace3. Therefore, ACE1VP harbors positive transcriptional effects for cellulase production, whereas native ACE1 had a negative effect on cellulase production. The transcript levels of cbh1, cbh2, egl1, egl2, bgl1, xyn1, and xyn2 in TACE1VP increased 1.3- to 3.8-fold in the Avicel-based medium as compared to the control for 12 and 24 h subculturing (Fig. 5E; Additional file 1: Figure S4d, e). Similarly, there was a remarkable increase (~ 1.3 to 3.0-fold) in the transcript levels of cellulase genes in TACE1VP as compared to the control strain in the lactose-based medium (Fig. 5F). The elevated transcript levels were consistent with increased enzyme production by TACE1VP in both Avicel- and lactose-based media. Aro et al. (2003) reported that deleting ace1 increased the cbh1, cbh2, egl1, egl2, xyn1, and xyn2 transcription levels in the Avicel-based medium. Our results revealed that ACE1VP acts as a positive regulator improving cellulase and xylanase production in Avicel and lactose media. The transcript levels of ace2 and ace1 (ace1vp for TACE1VP) in TACE1VP were similar to those in the control (the expression ratio was approximately onefold), whereas the transcript levels of xyr1 and ace3 in TACE1VP obviously increased in both Avicel-and lactose-based media as compared to the control (Fig. 5E, F). The xyr1 and ace3 expression ratios were approximately 1.9- to 2.6-fold in the Avicel- and lactose-based medium (Fig. 5E, F), indicating that the VP16 domain fused to the C terminus of ACE1 raised the transcript levels of key transcriptional activators XYR1 and ACE3. The increased transcript levels of xyr1 and ace3 in TACE1VP reflect improved cellulase and xylanase production; this result is consistent with other reports of overexpression of xyr1 and ace3 in T. reesei (Mach-Aigner et al. 2008; Uzbas et al. 2012; Häkkinen et al. 2014). TACE1VP and TACE2VP outperformed the control by showing markedly increased cellulase production. The crude cellulase produced by TACE1VP and TACE2VP was used to hydrolyze pretreated and biodetoxified corn stover (Qiu et al. 2017), with strain RUT C30 serving as a control. At the same FPase loading (15 U/g pretreated corn stover), 33.8 ± 1.5 g/L glucose was produced after 72 h of incubation by crude cellulase from TACE1VP. This result was approximately 22.6% higher than that produced by RUT C30 (Fig. 6). The increased glucose release resulted from enhanced pNPGase activity in TACE1VP, which can hydrolyze cellobiose to glucose. There was no significant difference in the amount of glucose released between the crude enzymes from TACE2VP and the control (Additional file 1: Figure S5); these data are in agreement with the unimproved level of pNPGase activity from TACE2VP in comparison with the control. Nonetheless, the production of cellulase by TACE2VP was improved, resulting in a smaller crude cellulase volume loading as compared to the control. Thus, the costs of cellulase from TACE1VP to TACE2VP were reduced successfully. After the supplementation with commercial β-glucosidase (4000 CBU/mL, Sunson Enzymes, Beijing, China) at the 2:1 CBU/FPA ratio, the glucose release from TACE1VP (40.6 ± 1.6 g/L) and TACE2VP (39.4 ± 2.1 g/L) was nearly the same as that observed with the commercial enzyme CTec2 (40.5 ± 1.2 g/L) (Fig. 6) at 72 h, revealing that the enzymes produced by TACE1VP and TACE2VP effectively hydrolyzed the pretreated corn stover. Additionally, cellulase from strain RUT C30 supplemented with β-glucosidase showed similar hydrolysis performance relative to the commercial CTec2. This phenomenon has been described in other reports too (Zhang et al. 2017, 2018), suggesting that the cellulase secreted by strain RUT C30 contains insufficient amounts of β-glucosidase (Pryor and Nahar 2015; Li et al. 2016; Zhang et al. 2016a). The TACE1VP strain showed higher β-glucosidase activity, which might be the reason for the improved hydrolysis yield with TACE1VP. We designed a universal and simple pattern strategy for enhancing the transcriptional activation of native regulators ACE2, ACE1, and XYR1 from T. reesei by linking their C terminus with the strong transcriptional activation domain of VP16. XYR1VP significantly improved xylanase gene transcription, while it abrogated cellulase gene expression. ACE2VP improved cellulase production in both lactose and Avicel media but was ineffective at inducing pNPGase and xylanase production. Moreover, ACE1VP functioned as a positive regulator of cellulase and xylanase expression. This is the first study to report the effects of ETAs on cellulase and xylanase production; these data are helpful for strain improvement of T. reesei. Additionally, our universal and simple pattern strategy for constructing ETAs can serve as an alternative genetic engineering method for increasing the yield of industrial products in other hosts. Hypercellulolytic strain T. reesei RUT C30 (ATCC 56765) serving as a parental strain and control was purchased from ATCC (Manassas, VA, USA). Escherichia coli DH5α and Agrobacterium tumefaciens AGL-1 were used as host strains for recombinant DNA manipulations and for Agrobacterium-mediated transformation (Michielse et al. 2008). DH5α and AGL-1 cells were cultured in the Luria–Bertani medium. Three ETAs—XYR1VP, ACE2VP, and ACE1VP—were designed by fusing the VP16 domain to the C terminus of XYR1, ACE2, or ACE1, respectively (Fig. 1). The C-terminal coding sequences and downstream sequences of natural TFs (ACE2, ACE1, and XYR1) were employed as the left (5′-) and right (3′-) homologous arms, respectively (Fig. 1). The linker and activation domain of VP16 of the herpes simplex virus protein were amplified by PCR from pG1V (Wang et al. 2014). All the primers are listed in Table S1 (Additional file 1). An unmarked genetic modification tool LML2.1 (Zhang et al. 2016b) served as the skeleton of all the plasmids, in which the hygromycin resistance gene was removed by xylose-induced Cre recombinase. The amplified 5′- and 3′-fragments were fused to the corresponding sites PacI/XbaI and SwaI of LML2.1, respectively, with the Seamless Cloning and Assembly Kit (TransGen, Beijing, China). The resulting vectors were named as pXYR1VP, pACE1VP, and pACE2VP (Fig. 1). Agrobacterium-mediated transformation (Michielse et al. 2008), transformed-clone verification, and xylose-induced marker rescue (Zhang et al. 2016b) were performed to obtain the ETA-transformed strains TXYR1VP, TACE1VP, and TACE2VP. Single-copy DNA integration in the transformed clones was verified by diagnostic PCR, amplicon sequencing, and quantitative PCR (qPCR) as described by Li et al. (2017). The related primers are presented in Additional file 1: Figure S1 and Table S1. TransStart TipTop Green qPCR SuperMix (TransGen) was used for qPCR assays. For each ETA, three randomly selected transformants (TXYR1VP-1/-2/-3, TACE2VP-1/-2/-3, and TACE1VP-1/-2/-3) were collected. For the fungal growth assay, conidia (final concentration 106/mL) from each T. reesei strain were inoculated into 100 mL of the minimal medium [MM, (NH4)2SO4 5 g/L; Urea 0.3 g/L; KH2PO4 15 g/L; CaCl2 0.6 g/L; MgSO4 0.6 g/L; FeSO4·7H2O 5 mg/L; ZnSO4·7H2O 1.4 mg/L; CoCl2·6H2O 2 mg/L; pH 5.5] containing 20 g/L glycerol, lactose, or Avicel in 500 mL Erlenmeyer flasks and were cultivated by shaking (200 rpm) at 28 °C for 72 h. Two milliliters of the culture liquid was collected every 12 h for biomass concentration analysis as described by Bischof et al. (2013). Intracellular protein contents were measured by means of the Modified Lowry Protein Assay Kit (Sangon Biotech, Shanghai, China). The biomass (in dry weight per liter) was quantified by calculating the intracellular protein content in a glycerol-, Avicel-, or lactose-based medium assuming 0.32 g of intracellular protein per gram of dry biomass (Bischof et al. 2013). For the cellulase production assay, conidia (107/mL) from each T. reesei strain were inoculated into 100 mL of the Mandels Andreotti (MA) medium (Mandels and Andreotti 1978) supplemented with 1 g/L peptone (Oxoid, Basingstoke, England) and 20 g/L glycerol in 500 mL Erlenmeyer flasks and were cultivated by shaking (200 rpm) at 28 °C for 2 days. Pregrown mycelia were harvested by filtration, washed with distilled water, and dried with sterile filter paper. Equal amounts of these mycelia were transferred into two 50 mL aliquots of fresh MA supplemented with 1 g/L peptone with 20 g/L lactose, or Avicel as the sole carbon source (Chen et al. 2016). Incubation was continued at 28 °C with shaking at 200 rpm for 4 days. When enzyme production was analyzed in glycerol, the mycelial culture time was prolonged to 4 days without transfer. Two milliliters of the culture liquid was collected via centrifugation at 14,000×g and 4 °C for 10 min. The culture supernatants were subjected to cellulase activity measurements. The mycelia were washed with distilled water, dried with sterile filter paper, and subjected to RNA extraction and biomass concentration assays. RNA was extracted using the FastRNA Pro Red Kit (MP Biomedicals, Santa Ana, CA, USA). cDNA was synthesized with TransScript All-in-One First-Strand cDNA Synthesis SuperMix for qPCR (TransGen). The levels of gene-specific mRNA were assessed by RT-qPCR on an ABI StepOne Plus thermocycler (Applied Biosystems, Foster City, CA, USA). The primers are described in Additional file 1: Table S1. The cycling conditions comprised 30 s initial denaturation and polymerase activation at 95 °C, followed by 40 cycles of 5 s at 95 °C and 60 s at 64 °C. Threshold cycle (Ct) values and PCR efficiency rates were used to calculate relative expression quantities by the ABI software. Transcript levels of target genes were normalized to sar1 expression (Steiger et al. 2010) by the 2−ΔΔCt method. Produced cellulase activities against filter paper (FP), p-nitrophenyl-d-cellobioside (pNPC), sodium salt of carboxymethyl cellulose (CMC), and 4-nitrophenyl-beta-d-galactopyranoside (pNPG) were measured at pH 5.0 throughout cultivation. One unit of FPase or CMCase activity forms 1 μmol of reducing sugar per minute during the hydrolysis reaction, which was quantified by the 3,5-dinitrosalicylic acid method with glucose as a standard (Miller 1959). One unit of pNPCase or pNPGase activity was defined as the amount of the enzyme needed to produce 1 μmol of p-nitrophenol per minute during the hydrolysis reaction. Xylanase I and xylanase II activities were measured by xylan degradation at pH 3.7 and 5.0, respectively, as described by Stricker et al. (2008). One unit of xylanase activity was defined as the amount of the enzyme needed to generate 1 μmol of xylose reducing sugar equivalents per minute under the defined assay conditions. Protein concentration was determined by means of the Modified Lowry Protein Assay Kit (Sangon Biotech, Shanghai, China). Pretreated and biodetoxified corn stover was found to contain 37.6% of cellulose and 4.4% of hemicellulose by dry mass and was kindly provided by Professor Jie Bao (Qiu et al. 2017). 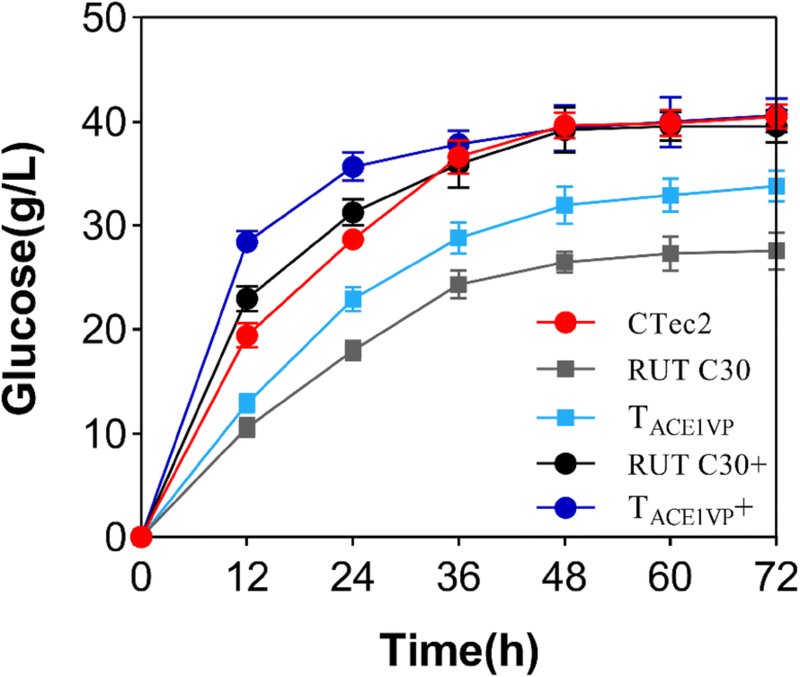 The crude enzymes produced by the T. reesei ETA transformants and RUT C30 were collected in the Avicel-based MA medium after 4 days of fermentation after the switch from the glycerin-based medium. Saccharification was performed on 10% (w/v) pretreated corn stover as a substrate in a flask with FPase loading (15 U/g dry biomass) at 50 °C and pH 5.0 (50 mM sodium citrate buffer) for 72 h. The enzymes were supplemented with β-glucosidase (Sunson Enzymes) at the CBU/FPA ratio of two to hydrolyze pretreated corn stover when necessary. The glucose release was evaluated as described by Li et al. (2016). All the experiments were conducted with three biological replicates and three technical replicates for each biological replicate. Student’s two-tailed t test was performed in Microsoft Excel (Office 2013) (Microsoft, Redmond, WA, USA) to detect significant differences between two samples. P ≤ 0.05 was considered to indicate statistical significance. WW1 initiated, designed, and coordinated the study and reviewed the manuscript. JZ planned and carried out the experiments and measurements and interpreted the experimental data. CW analyzed the partial data. DW and WW2 provided the research funding. All authors read and approved the final manuscript. We wish to thank Prof. Jie Bao (State Key Lab of Bioreactor Engineering, East China University of Science and Technology, Shanghai, China) for providing the pretreated and biodetoxified corn stover. All the data generated or analyzed during this study are included in this article. All the coauthors have read and approved the submission to Bioresources and Bioprocessing. This research was supported by the National Natural Science Foundation of China (No. C010302-31500066) and the Fundamental Research Funds for the Central Universities (No. 222201714053). 40643_2018_226_MOESM1_ESM.docx Additional file 1: Table S1. Primers used in this study. Figure S1. A schematic for identification of gene integration and single-copy DNA integration into the genome of transformants. Figure S2. Xylanase production and a comparison of transcript levels of xylanase-related genes between TXYR1VP and RUT C30. Figure S3. The amount of secreted protein and xylanase production in TACE2VP and RUT C30. Figure S4. The amount of secreted protein and xylanase production in TACE1VP and RUT C30. Figure S5. Hydrolysis of corn stover by CTec2 and by the crude enzyme from TACE1VP or TACE2VP.